It looked suspiciously phishy so I checked the source – click here to see the source. The full header indicates that the sender might be spoofed, the chunk of code suggests a web bug that verifies that the message has been viewed, hence that the receiver’s address is valid and spammable, and the last two lines show that what appears to be the URL of the legit gmail login page actually links to a well-made duplicate: http://www.4dsystems.com.au/flashimg/gmail/signon.html. Being in Switzerland, I reported the phishing attempt to the cybercrime coordination unit of the CH federal police via the form reachable at its scoci.ch site (cyco.ch in English). A few hours later, Firefox – and maybe other browsers – blocked access to that phishing page with a “counterfeit page” warning, and now it has been removed altogether. I’m not saying that my reporting that attempt caused the block and deletion: others probably reported the problem before me, and Google (of which gmail is an app) and Firefox have their own tools (see Google & Firefox 2 Anti-Phishing Warning In Action by Danny Sullivan. Search Engine Land. Jan. 20, 2007). However, reporting phishing attempts is a civic duty, as these tools rely on users’ reports. 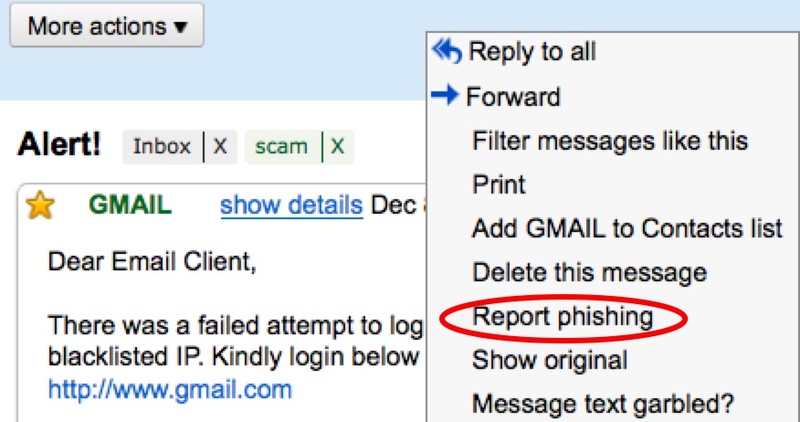 Please add other ways for reporting phishing, be it to a country’s official cybercrime unit or to a trusted organization.